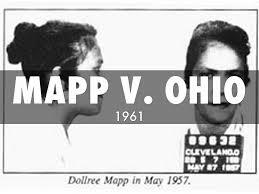 Mapps v. Ohio Decision research papers discuss the case that extended the exclusionary rule to the states. The Supreme Court revisited the issue of extending the exclusionary rule to the states in Mapp. In the facts of this case, police arrived at appellant’s home pursuant to information that a person was hiding the home that was wanted in connection with a bombing. When the police demanded admittance into the home of the appellant who resided in a third-floor apartment, appellant refused admission unless the police produced a search warrant. As a result of the refused admission, the police began a surveillance of the house. The police again sought admission three hours after the first attempt. When the appellant did not answer the door, the police gained entry to the house by forcibly opening the door. The appellant at that time demanded to see the warrant authorizing the entry. The police waved a paper at the appellant, and appellant took it from the officer and placed it beneath her clothes. A struggle followed with the police attempting to retrieve the paper, which resulted in the handcuffing of appellant. The police then undertook a search of the premises encountering materials that were deemed obscene under an Ohio statute. The seized materials alleged to be obscene were not the subject of the original search intent and were incidental to the matter under investigation. The state stipulates that the procedures used by the police in obtaining the evidence violated the Fourth Amendment protections against unreasonable search and seizure, but relied on the holding in Wolf to admit the evidence at the appellant’s trial. The primary issue in the Mapp case was whether the Court should overturn its ruling in Wolf and extend the exclusionary rule to the states. One of the primary concerns of the Court in the Mapp decision was articulating the rationale for overturning Wolf. The Court examined what it deemed to be the critical components of the Wolf decision in order to determine if the case had been rightly decided based on constitutional considerations. The first component cited in Wolf was the position of the majority of the states against the adoption of the exclusionary rule. The Mapp court noted that this condition had changed with the majority of states now supporting the rule. The second component was the availability of alternative methods of protections, which the Court now characterized as worthless and futile. The third component was the lack of sufficient refinement in the application of the exclusionary rule at the state level. The Court determined that rulings subsequent to Wolf had resulted in sufficient clarification of the way the exclusionary rule should be applied. Based on the changed circumstances, the Court determined that Wolf should be overturned. As a result, the Court ruled that the exclusionary rule is an essential part of both the Fourth and the Fourteenth Amendments, and must be followed by the states. In a concurring opinion, Justice Black indicated that the exclusionary rule is also buttressed by the Fifth Amendment protection against self-incrimination, which was largely based on an extension of the rationale in Boyd. Justice Black was uncertain that the Fourth Amendment standing alone would be sufficient to mandate the exclusionary rule. Together with the Fifth Amendment, however, the exclusionary rule prevents an individual from self-incrimination through papers or other documents that are improperly seized and admitted into trial as evidence. From this perspective, the improper seizure results in the incrimination of the accused by compelling the disclosure of evidence that would otherwise remain private and unknown at the trial. In another concurring opinion, Justice Douglas suggested that the only alternative remedy for improper search and seizure was a civil action for trespass, which was deemed inadequate as a deterrent for misconduct. The concurring opinion did not directly discuss the possibility of a specific statutory cause of civil action that differed from trespass, or the possibility of the development of an alternative administrative remedy in the form of sanctions against the law enforcement official engaged in the misconduct. The concurring opinion also refers to the sliver platter doctrine as a “working arrangement” between law enforcement officials to evade the spirit and intent of the constitutional protections, with the extension of the exclusionary rule to the states necessary in order to end this practice. The Mapp Court noted that there were three purposes served by the exclusionary rule. The first purpose was to maintain constitutional privilege, with the Fourth Amendment clearly providing protections against unreasonable search and seizure that must be maintained. The second purpose was to prevent judges from extending Fourth Amendment violations to the courtroom by admitting evidence that was illegally seized. This purpose focused heavily on maintaining the integrity of the courts, and was base don the assumption that the public would lose regard for the courts if they routinely admitted illegally obtained evidence. The third purpose was to deter police misconduct by removing the incentive to engage in searches and seizures that violated the Fourth Amendment. In the Court’s general discussion of the rationale behind the decision in Mapp, deterrence was an important factor in the extension of the exclusionary rule to the states but not the sole rationale. In subsequent decisions on the issue of the exclusionary rule, the focus of the Court moved toward greater reliance on the deterrence factor. Some of the exceptions to the exclusionary rule were based on situations in which the exclusion of evidence would not be a deterrent to the misconduct of police. In addition, the Warren Court refused to apply Mapp retroactively, which suggests that it viewed the exclusionary rule as a deterrent to future police misconduct and not a remedy for past misconduct. Because of this emphasis on deterrence, criticism of the exclusionary rule has often focused on alternative methods of deterring police misconduct. Based on the decisions in Weeks and Mapp, there are three requisite elements in the police conduct that must occur in order for the rule to apply. There must be an illegal action on the part of a law enforcement official or by an agent of law enforcement. There must be a seizure of evidence. There must be a causal connection between the illegal action and the seizure of the evidence. When the constitutionality of the seizure of evidence is challenged in the courts, the burden of proof shifts to the prosecution to demonstrate by a preponderance of evidence that the evidence was properly obtained. A failure to make this showing results in the suppression of the evidence in the primary criminal proceedings against the defendant. Both before and after the Mapp case was decided, the Supreme Court has established a number of exceptions to the exclusionary rule. These exceptions are based on establishing a balance between the protections established by the Constitution and the interest of society in establishing reasonable methods for the prosecution of criminal cases. In general, the exceptions have been developed on an ad hoc basis as issues regarding the application of the exclusionary rule present themselves to the Supreme Court. The approach to the exceptions suggests that the use of the exclusionary rule as a Fourth Amendment protection is guided by an implicit reasonableness standard. In its approach to exclusionary rule exceptions, the court balances the constitutional interest of deterring police misconduct against the societal interest of insuring that juries have all probative evidence. When the situation is such that the admission of the evidence does not further the objective of deterrence, the Court is willing to entertain the possibility of an exception. Paper Masters writes custom research papers on Mapps v. Ohio Decision and discuss the case that extended the exclusionary rule to the states.